The garden is waking up, with early daffodils, other bulbs, and the first perennials in flower. 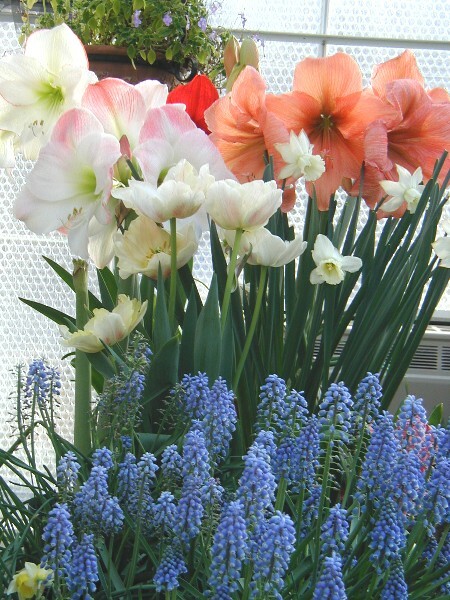 The greenhouse is winding down in a blaze of glory, with multiple pots of amaryllis, double early tulips, the last pot of daffodils, and a clementine box packed with Muscari 'Christmas Pearl' awash with blue. A lovely clutter of flowers, rewarding when I'm in there tending to things and a superb view whileI'm sitting at the kitchen table. It's so sunny these days that the roof vents are wide open and the exhaust fan runs and runs. On my weekend "to do" list - put up greenhouse shade cloth. For our route home from Steve and Melody's garden I chose to go up-river (Delaware River that is) on Route 32, which is the Pennsylvania side. That way my friend Paul could view places we'd not been before. The road is narrow, it winds, it is adjacent to the canal, sadly damaged in last April's big no-name storm and the severe rains of the September before that one. There are some charming bungalow / cottage style homes right next to the road, and a couple of grand estates to see too. As we were driving though Point Pleasant, getting closer to the Upper Black Eddy / Frenchtown Bridge I said "Let's stop here." and pulled over to the side of the road. 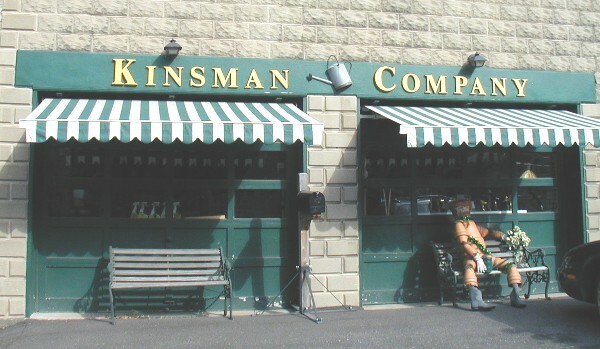 I had spotted Kinsman Company. Though I imagine most of their business is accomplished over the Internet or by mail-order, the company does have this store, which is located in the Old Point Pleasant Fire House. 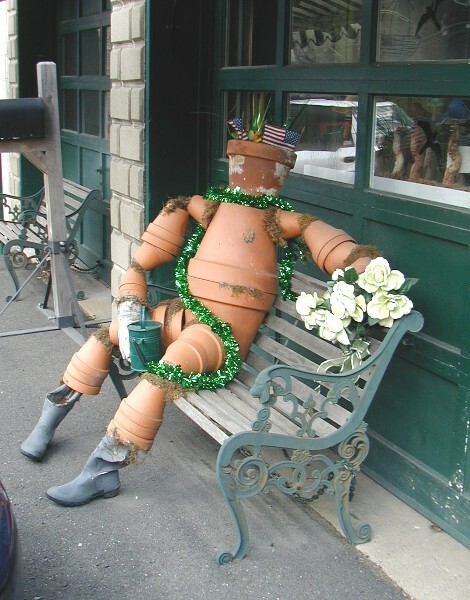 "Time to stretch my legs," said Paul as we got out of the car, my camera in my hand in order to take a picture of the Pot Man who sits on a bench in front of the store. We walked around and about through the couple of rooms of merchandise, the bargain room, and a quick glance at the year-round display of Christmas ornaments. What appeals to me? 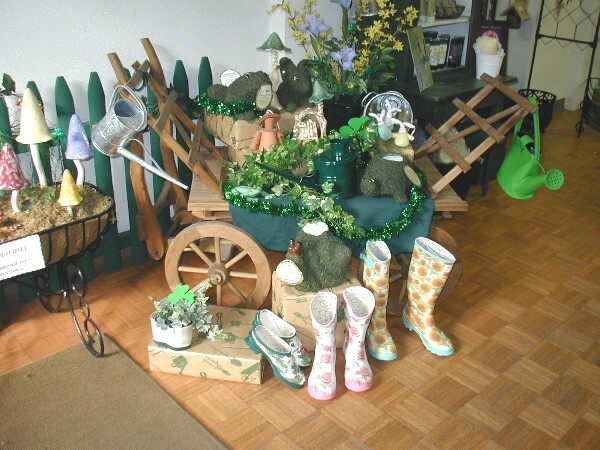 Kinsman Company sells trinkets and tools, decorative garden objects and useful bits and bobs: there are a diversity of plant supports from obelisks, tuteurs, and trellises to linking stakes and grid-filled hoops with mix 'n match legs in 3 different heights. Watering cans. 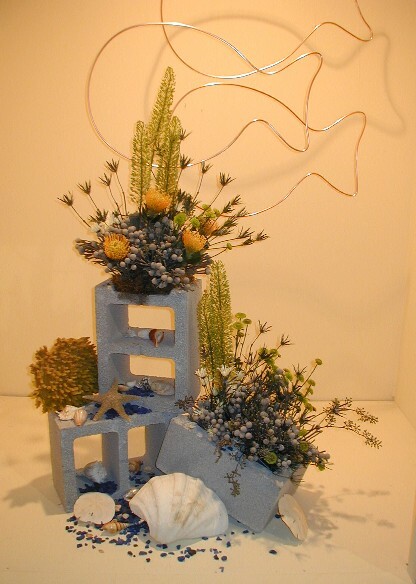 All sorts of heavy-duty wire planters, troughs, and cradles, and the cocoa fiber liners to use with them. Pruning saws, triming shears, pruners, and pruner sharpeners. A lovely cold frame kit (with an available extension - just like a glasshouse a cold frame quickly becomes filled to capacity.) There are also a bunch of cutesy mushrooms - funki-fungi, quivering metal tippy toadstools, ceramic tippy toadstools, tinkling toadstools, colorful little glazed ceramic garden pixies and more. Paul got some Algoflash liquid fertilizer concentrate. I got yet another small galvanized watering can with a long spout, which I think will be good for hanging baskets, and a bristle wrapped wire frame boot scraper in the latest attempt to keep dirt outdoors instead of all over the floors. Kinsman Company is the sort of place that has lots of things you've been looking for, and other items you didn't even know you needed / wanted. Admittedly, flower-printed Wellington boots look more garden-party than garden-worker. But they certainly are cute. When our friend Paul comes for a weekend visit from Connecticut, I like to find something for us to do. If it is a stroll through the near-by tourist mecca of New Hope, Pennsylvannia and lunch, then my spouse comes along to make it a trio. When the focus is on plants and gardens, it's a duo. Such was the case for this last day of winter visit to Steve and Melody's garden in Willingboro, New Jersey. Steve's been inviting me for a couple of months now, mentioning how different the garden looks with evergreen trees and shrubs prominent against the bare branches of their deciduous neighbors. February was too cold, I thought, and it is always more enjoyable to have a friend accompany me for a jaunt to visit garden(s). Accordingly, off we went to Willingboro on Sunday morning. The March winds that are supposed to come in like a lion and go out like a lamb were decidedly frisky. The sun was playing peek-a-boo, and hiding more than it was shining. In other words, only hard-core garden addicts would travel more than an hour to spend better than twice that time strolling around looking at plant, red cheeks, drippy noses, and frozen fingers even with gloves on. Willingboro is easily in USDA zone 7, as compared to my zone 6 warm and Paul's Connecticut garden in zone 6 cold. 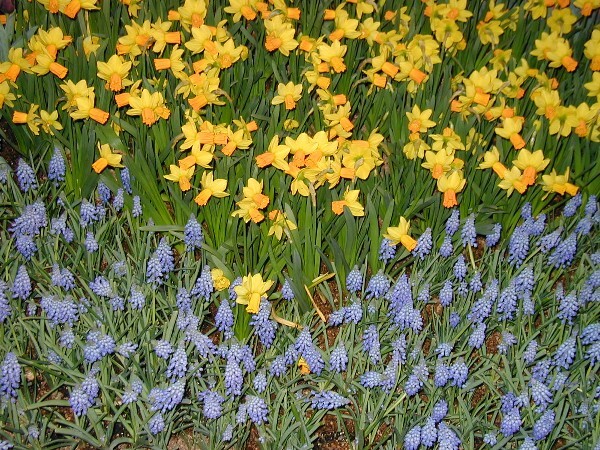 Bulbs were in bloom: snowdrops, early daffodils, and the first blue hyacinths, 'Delft Blue', said Melody. 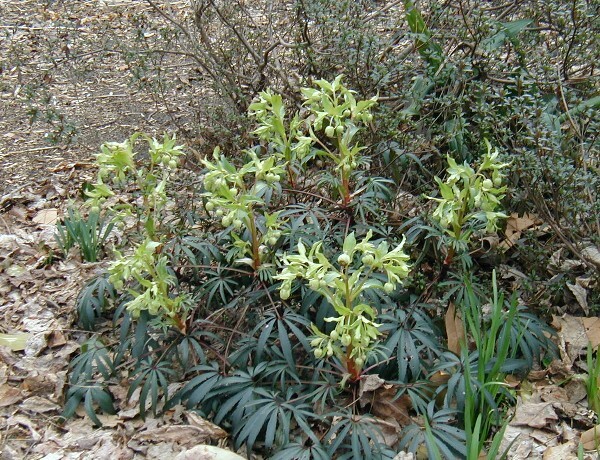 And hellebores, of course. All of us were warmly dressed. 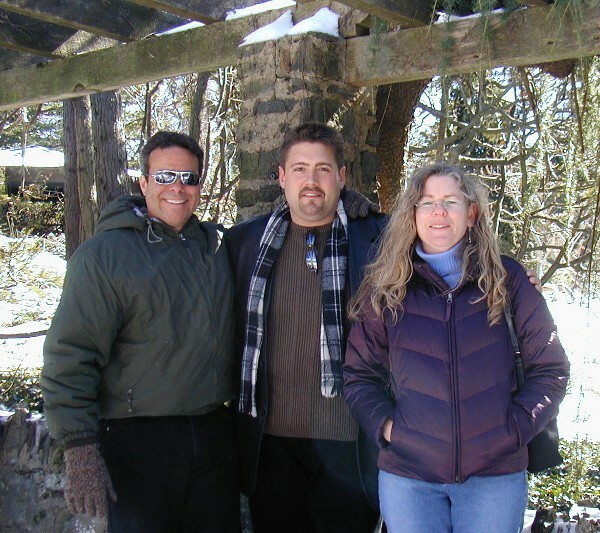 I had on a turtleneck jersery, shirt, warm outer jacket, woolly scarf and bright red watch-cap. Inured to the cold, Steve comes strolling out of the garden, modelling what the weatherproof gardener will wear. As well as the bulbs and earliest blooming herbaceous perennials huddled close to the ground, away from the wind, there were trees and shrubs in flower on this blustery March day, tender-appearing flowers such as Prunus mume, with silken petals. 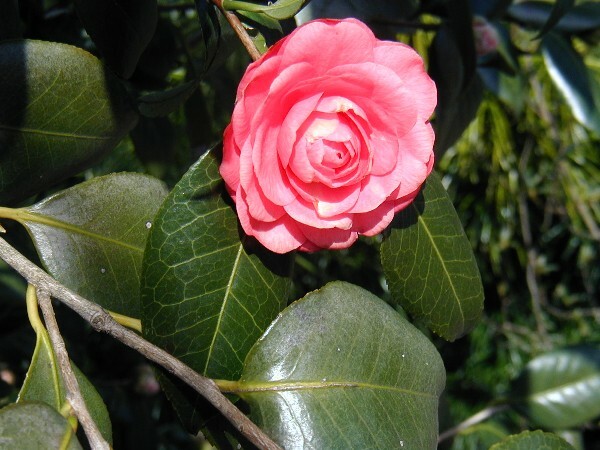 The first camellias were also in flower, gambling with the weather. 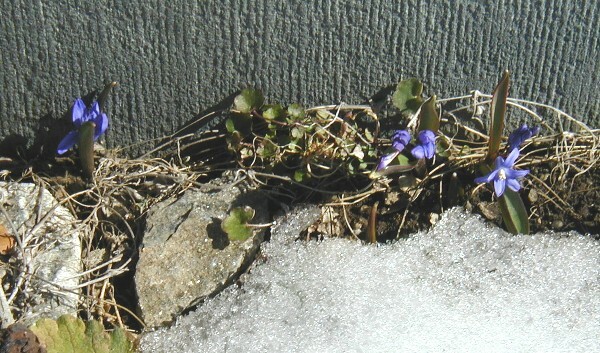 If the cold is sufficiently bitter, their opening buds will freeze to brown mush. The next spell of milder weather coaxes the next crop of buds to open, tempting fate. How lovely, pink perfection of a camellia blossom against polished evergreen leaves on this, the last day of winter. We wandered back into the woodland area at the back of the 4.5 acre property. It's wet back here, a pristine wetland area of marsh and a beaver dam. Steve's planted bald cypress, well-enough established that their knobby knees are showing above the water, trunks ringed with fencing wire to keep the beavers from harvesting such exotic fare. A skunk cabbage, Symplocarpus foetidus, has its rich purple-red fleshy hood on display. Well, it would. This earliest of our native herbaceous plants quite literally generates heat and melts its way up and out of frozen ground. There were other shrubs in flower here and there throughout the garden: Lonicera fragrantissima, an especially early and sweetly fragrant honeysuckle with white flowers, Viburnum 'Pink Dawn' with its clusters of pink, equally fragrant fragrant flowers, a cherry, and a few more. As we headed back towards the house (more of a rambling meander, to be honest, with a swerve to the left and a correction to the right) I noticed a shrub with a rather odd appearance. Bare branches were adorned with dangling white bell-like clusters. As I got closer I could see that each was a tightly packed array of silky-haired tubular flowers. Steve picked a cluster to show me their sunny centers, and urged me to smell their fragrant perfume. I've visited gardens in the snow, after dark by flashlight, in the rain. Summer heat, winter chill - a garden visit is always a good way to occupy my time. And today was no exception. Monday was absurdly warm. Yesterday was March winds in like a lion, with the same overnight and all day today. Flowers (bulbs mostly) are hurling themselves forth from the earth with delicious abandon, much to the delight of honeybees. They're blooming here at BelleWood Gardens, in Jerry's garden, at Wave Hill, where I popped in on my way home from the New York Botanical Garden on Tuesday. 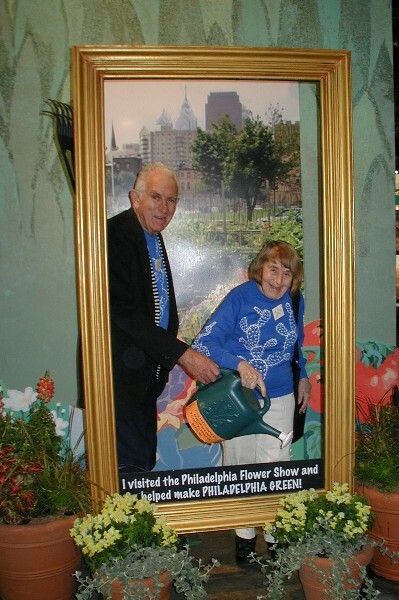 How to describe it - after the ball, I mean Philadelphia Flower Show, is over and the results are tallied up here's one really happy guy. Jerry puts his all into the competition. He starts months and months before the event, selecting plants he thinks are not merely potential entries but probable winners. They're grown, groomed, cosseted (but not pampered - cacti and succulents don't respond well to pampering.) He chooses their exhibition pots with attention to detail, not merely of size and proportion but also color. He's even had pots crafted to his design by a potter. Then there's the last minute agony of deciding in which class to enter what plant. Some of this is obvious. For example either a plant is in a 6 inch or under versus an over 6 inch pot. It's in bloom or it is not. But then, should it be entered as an individual, in a duo, as a part of a trio. Here, or there? Refining the choice correctly improves the chances of a win. 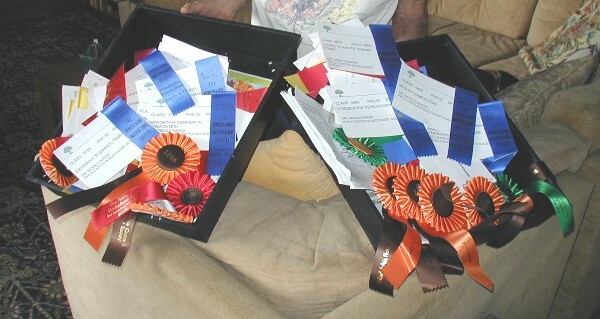 There's all sorts of ribbons and awards: most familiar are the blue, red, yellow, and white of first, second, third and honorable mention in each class. Then there are specialty awards such as the Philadelphia Cactus and Succulent Society rosettes, limited to four awards on each day of judging. In case you're not aware of it, over the eight days Philadelphia Flower Show there are three different days of judging in the horticultural division. Plants previously shown (and judged) are removed, and another crop of entries displayed. 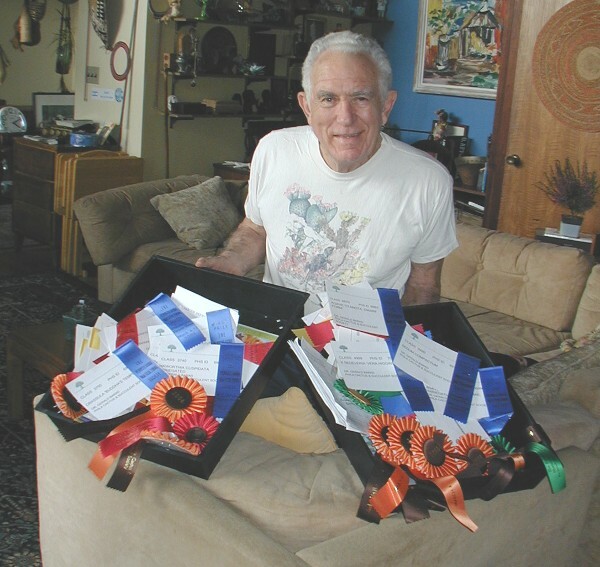 Thus, merely on the first day's judging on the Saturday before the shows opening on March 5th, Jerry plants were awarded all four of the Philadelphia Cactus and Succulent Society's rosettes and 15 blue ribbons. Is it worth the time, effort, attention to detail, and agonizing over things? You look at his happy grin and tell me. It's getting to that time of year. Yesterday Paul wanted to hose some of the mud off his car. He ended up wetter than the vehicle - leaks in the hose. Memo to self: check out all hoses and make note of those needing repairs and / or replacement. Then I woke up this morning and it was raining. Great for the outdoor plants but everything indoors, from bananas and palm trees to aspidistra and snake plants, still need my more or less frequent services with a watering can. And I'm persnickety when it comes to watering cans. I dislike tiny little watering cans that are empty after refreshing two African violets. Very large watering cans are too heavy to carry and (especially indoors) difficult to control. I don't care if water slops around outdoors, but it is a problem indoors. As the old saying goes, "A pint's a pound the world around." Do the math: a pint of water weighs one pound, two pints to a quart, four quarts to a gallon. A gallon of water weighs eight pounds. At 16 pounds two gallons is about the upper level of what I find convenient. Even galvanized cans need to be emptied for storage. Leave them sitting long enough filled with water and they can start to develop pinhole leaks. Perhaps that is why the splendid Haws watering cans are now available with epoxy finishes. You'd think plastic is at the top of my list, but aesthetics get in the way. 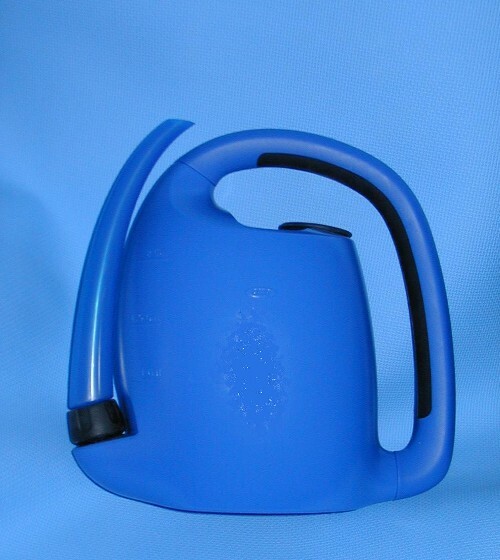 Many watering cans made from plastic are merely functional, utilitarian but unattractive. In a crossover move, Oxo™, the good-grip folks who fill our kitchen drawers with black-handled vegetable peelers and other widgets have taken on toolsheds. They're making gadgets for gardeners. 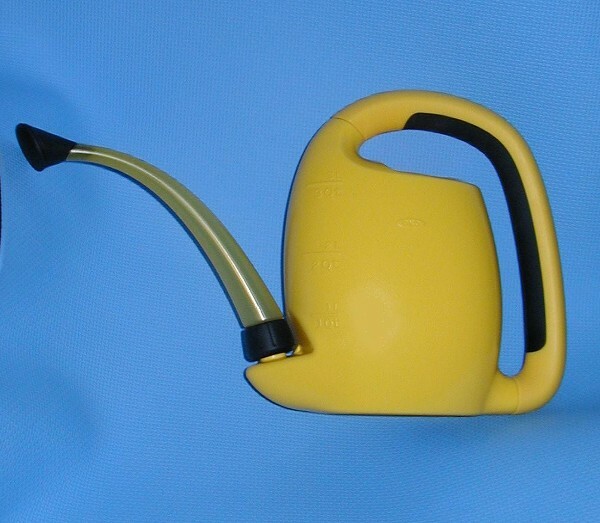 Including nicely designed watering cans in bright crayola colors of green, yellow, orange, blue, charcoal gray and white for the smaller version and all except gray for the larger size recommended for outdoor use. Reasonably priced too, with suggested retail of $14.99 for the 3-quart model and $24.99 for the 2-gallon size. and some of them, like mine, rather large - that it is also useful indoors. Some clever features: The translucent spout (something which allows you to check the water level as you fill the can) swivels back against the body for easier filling (ever had to tilt at a weird angle to fit a too-big watering can into a too-small sink?) and storage. There's a notch at the back of the watering can's opening for storage of the rose (see the flat black cap-like widget at the top of the can's body.) A rose is that perforated dingus that breaks water from a flooding stream into a gentle rain. And you know it's an Oxo™ product from the comfortable black layer on the underside of the handle. If you cannot find them elsewhere, look up Pour and Store watering cans on Oxo. I thinks these are going to be a pair of very handy watering cans to use around the garden. And indoors too. The work continues on the bulb exhibition for next fall, to be held in the William D. Rondina and Giovanni Foroni LoFaro Gallery of The New York Botanical Garden's LuEsther T. Mertz Library. Monday's preview was in the gallery itself, with books laid out in the seven display cases and three vitrines. Intensive work, with multiple layers of interest focusing on informative content and that wow! factor. 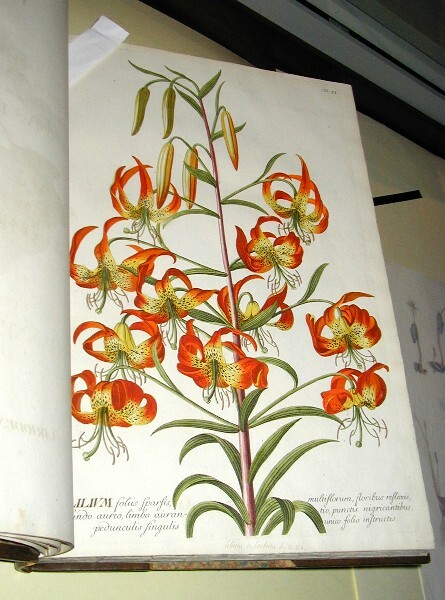 Since the books and prints are displayed behind glass and with subdued lighting, it is important that they have enough substance to fascinate and appeal to the gallery's visitors. Ever the instructor, I've chosen themes such as What's A Bulb, Bulbs We Eat, Bulbs for Bouquets, Fragrant Bulbs, and more. The case on the end wall, opposite the door into the gallery, will have the theme of Tulipomania, the 17th century Dutch passion for tulips feathered and flamed in red or yellow. 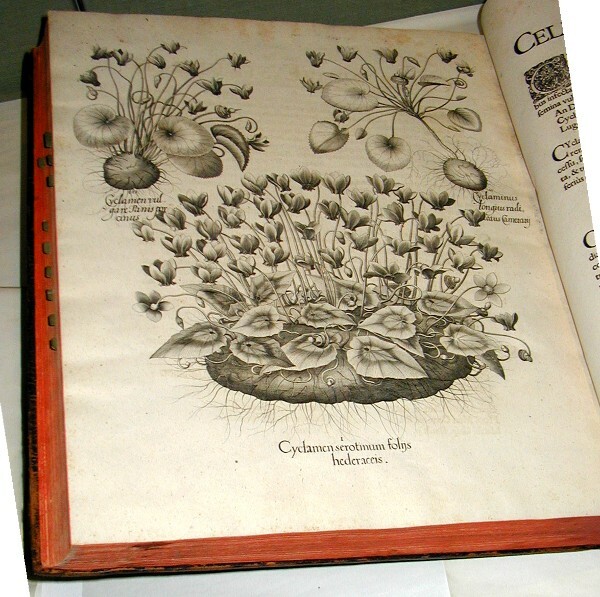 Thornton's Temple of Flora will anchor the case, with a large folio to its left and another to the right. 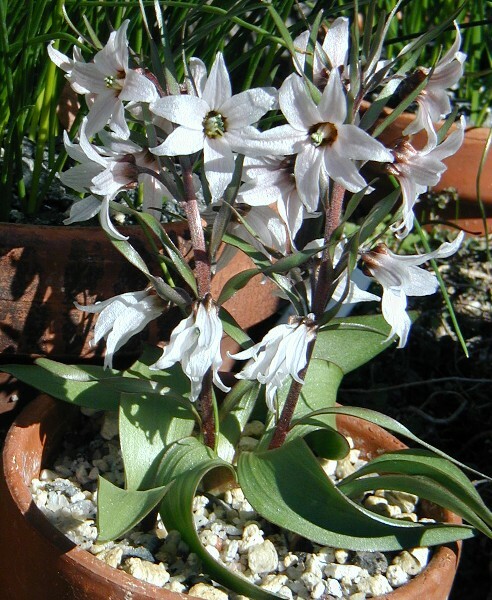 Of imense interest to area gardeners, Deer-Resistant Bulbs is another theme I anticipate having great appeal. Given the exhibition's opening in October, one case features Bulbs for the Autumn Garden. And since "bulb" and "native" are not mutually exclusive, there's another case that focuses on Native Bulbs From Our Neighborhood. There's still more tweaking and fiddling to do - not only the choice of a few more images, but also the arrangement of items in each case. For example, if a large folio has its image to the right and a blank page on the left, then where possible the book is more properly placed to the left-hand side of the case. Critically, every page must be behind a full pane of glass, as having the edge of a glass panel visually fall across the image field would spoil the display. The work is intense, also fascinating and rewarding. This is going to be a fantastic exhibition. 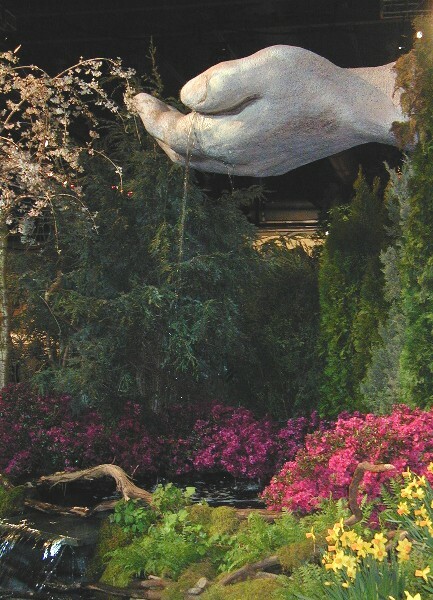 A flower show, especially a world class event such as the Philadelphia Flower Show, has more than a modicum of unreality about it. Fantasy rules. It's not merely that fields of flowers such as these masses of daffodils and grape hyacinths are not yet vibrantly in bloom in our gardens. Like Bea and Jerry, the plants and gardens are captured in a frame, moments out of time. Who cares what the season might be in reality. 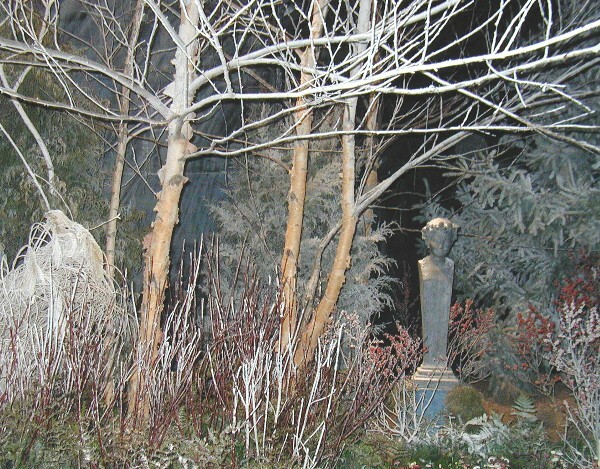 Styers Nursery placed masses of hyacinths in a wintry landscape. Mother goddess Natura holds out her hand, trickling water over the floriferous earth. Flower arranging is an important component of the displays, regardless that no one would have cinderblocks on the dinner table. Dragons and fairies, no less unreal than the mingled seasons and fantasy gardens leading up to Springtime's magical awakening in reality. I was at the Barads for an outing to opening day of the Philadelphia Flower Show. Brilliant sunshine invited me into Jerry's garden for a quick look / see before we drove off. This appealing clump of iris danfordiae in the rock garden caught my attention. 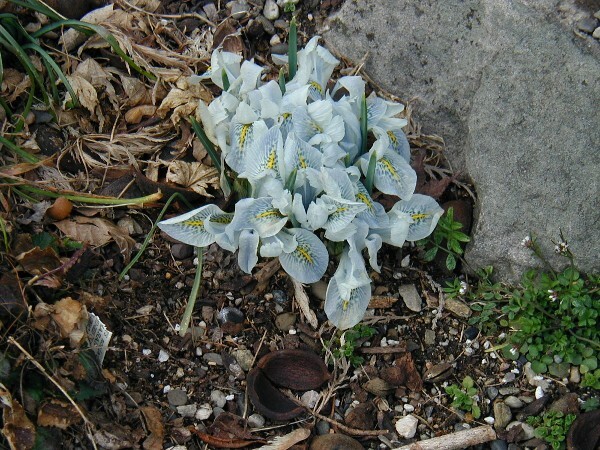 Iris danfordiae is one of the dainty little bulbous iris of early spring. The falls reduced to mere bristles, it is the greeny-yellow standards, speckled with brown, that provide its charm. 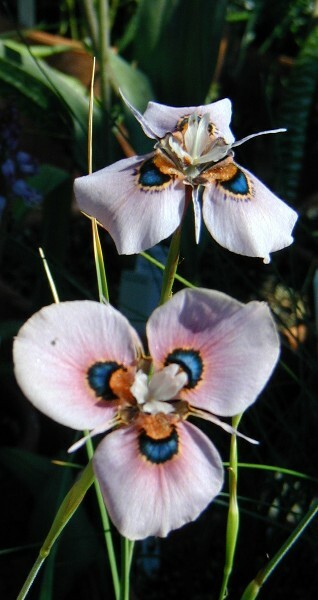 Introduced from Turkey in 1876 by Mrs. Danford, it needs a well-drained limey site with full sun. 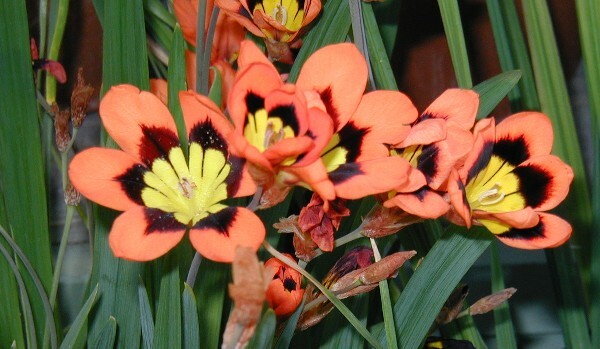 There its sweetly scented flowers often open as early as February. 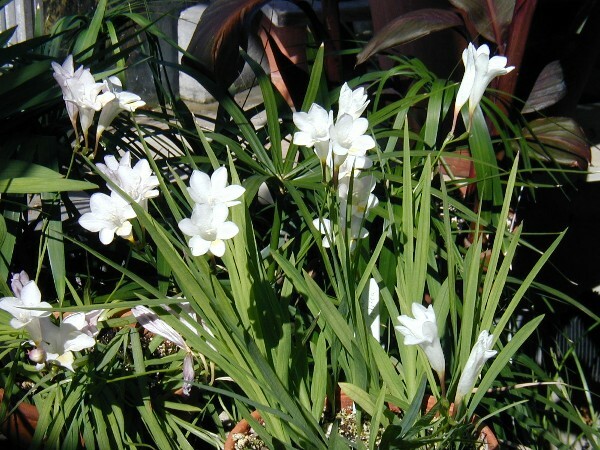 Bulbs are a technique utilized by certain plants to get through hard times. 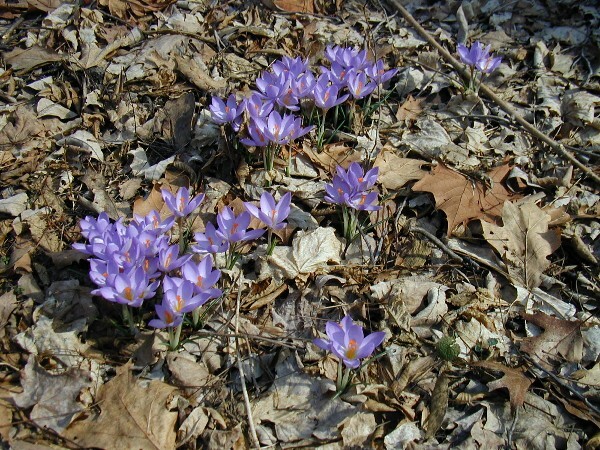 Most gardeners find the spring-flowering crocus, snowdrops, tulips, daffodils, and hyacinths a familiar assortment. These use stored food reserves to get a jump on the season, consuming food put away for use when winter's cold weather is drawing to a close. 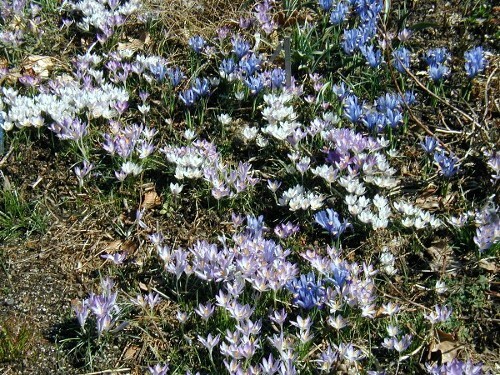 Other bulbs rely on underground storage to cope with drought. Bulbs from the fynbos scrub lands of South Africa never experience extended cold weather common to the native haunts of daffodils and tulips. They do need to deal with extensive summer droughts. 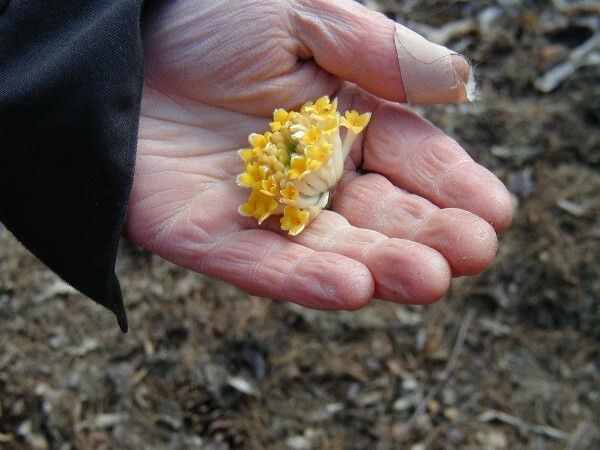 Moreobver, their summer dormancy / winter growing offers gardeners a welcome respite from the cold-season doldrums. No where is this more obvious than at Wave Hill, where Scott Canning's pots of babiana and moraea, species gladiolus, freesias and more add spectacular color to the conservatory. If "gladiolus" makes you think of the big stiff spikes of flowers so popular as a cut flower, think again. 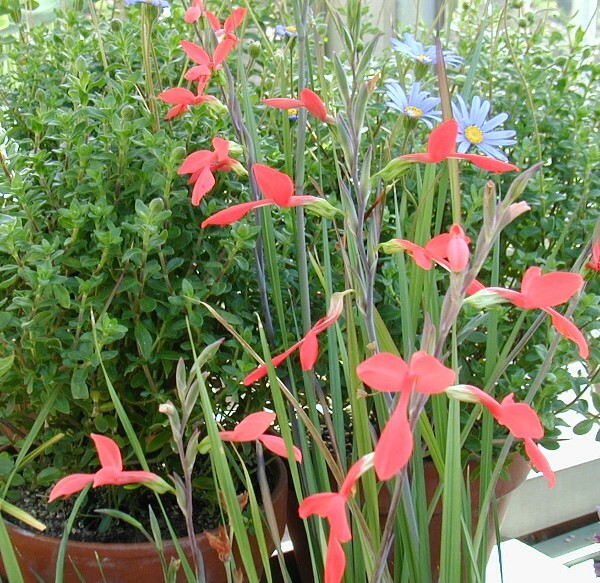 Dainty Gladiolus splendens, (just one of about 250 different species) is far more fairy-like and dainty than those. An alpine house is a specialized sub-set of glasshouse (a term I prefer to greenhouse, which may be confused with a house painted green.) Familiar to rock gardeners, an alpine house is used to grow plants that are borderline hardy in winter conditions, plants that might need protection from summer rains, or those such as certain species of primroses whose flowers might be damaged by overhead water, e.g. rain. Heated just a few degrees above the freezing point, the idea is not to keep the plants warm. Rather, to grow them just on the edge of the conditions they prefer. 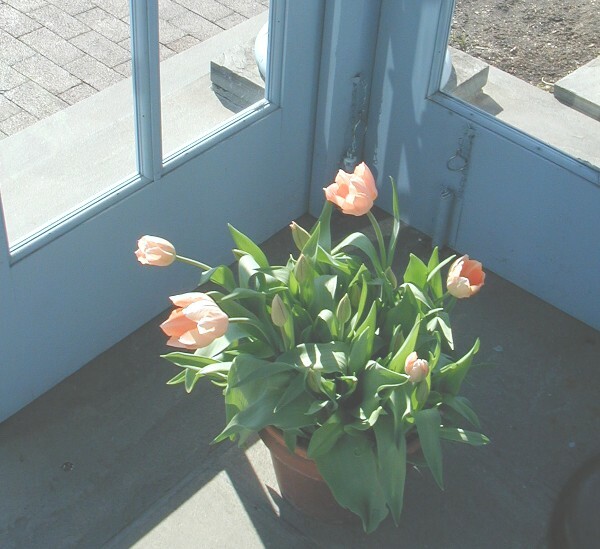 In winter, sunshine can heat the enclosed glasshouse to torrid temperatures - think of a closed-up car in a sunny parking spot. Ventilation is critical, so roof vents and fans that run 24 / 7 are important. The alpine house at Wave Hill has the added benefit of removable window panels that allow conditions to cool down, and provide plants with the aerated, windy conditions common to their native mountains haunts. Thus, on a windy day in early March that has us bundled up in jackets, scarves, and gloves sees the every other window on the alpine house' long wall removed. All the better, my dear, for a close-up view of some sweet flowers. 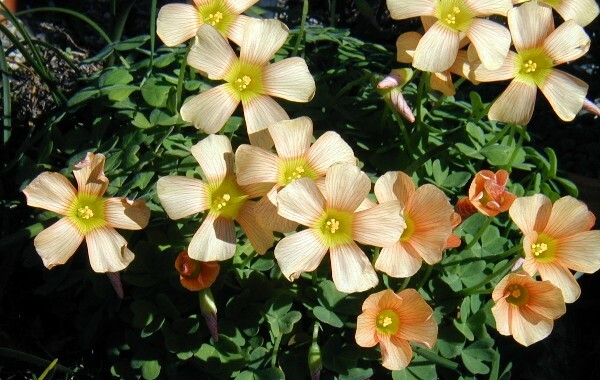 Looking far too tender for the rough winds that set its petals a'trembling, Oxalis tricolor's silken petals are sturdier then they seem. A marvellous little Fritillaria stennanthera has been brought to this peak of perfection, in bloom just 3 years from seed. Here's one you could have in your garden. 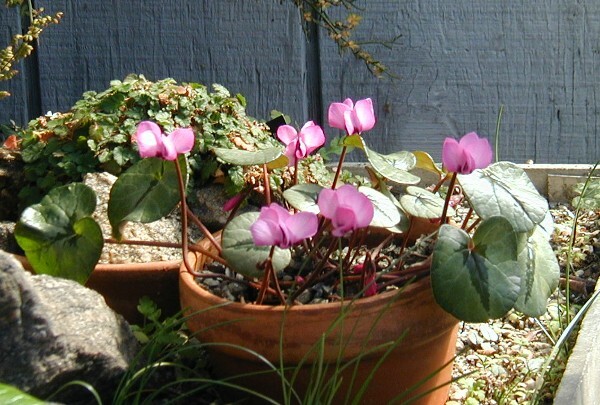 Having formed its buds last fall, Cyclamen coum often flowers outdoors in February. 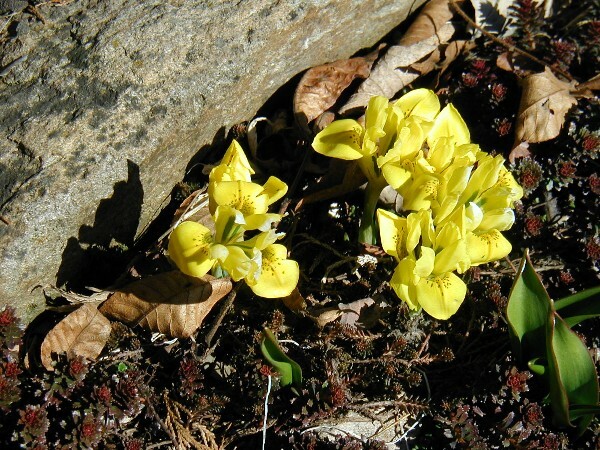 The alpine house allows us to enjoy its blooms without crawling on the ground, or scraping away the snow. I'd been to Wave Hill in January. Actually, I'd been there twice. 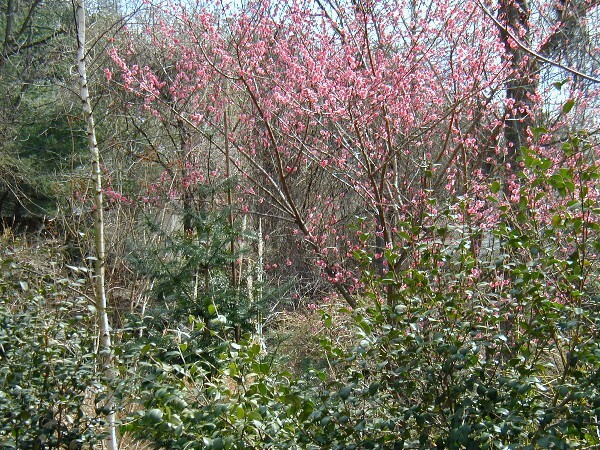 The month-long thaw provided pleasant weather for strolling around the grounds and even coaxed a few shrubs into bloom. Surely when I returned a month later there would be even more of a hint of spring. Well, yes. And no. 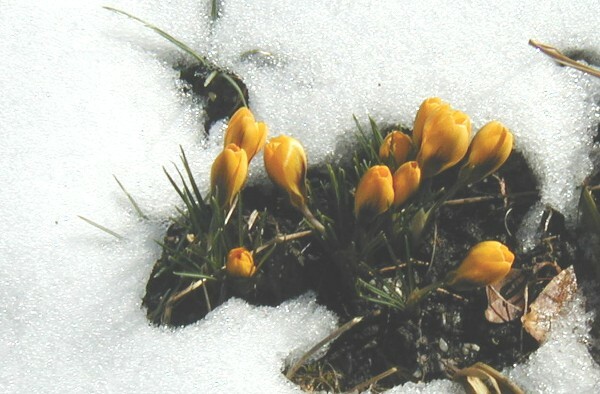 True, some of the earliest bulbs were in bloom: snowdrops, Galanthus nivalis, and winter aconites, Eranthis hiemalis, assorted crocus and the aptly named glory-of-the-snow, Chionodoxa luciliae. While plants are showing the first signs of life, awakening into bud and bloom, Wave Hill's gardeners are much more active. Clean-up and maintenance is an on-going thing, especially with the strong winds that have been shaking things up, and knocking them down too. Trees drop boughs, even topple over when push comes that strongly to shove. One that went, down in the woods, was a locust. Now, locust has an extremely rot-resistant nature. It's popular for fence posts, for just that very reason. 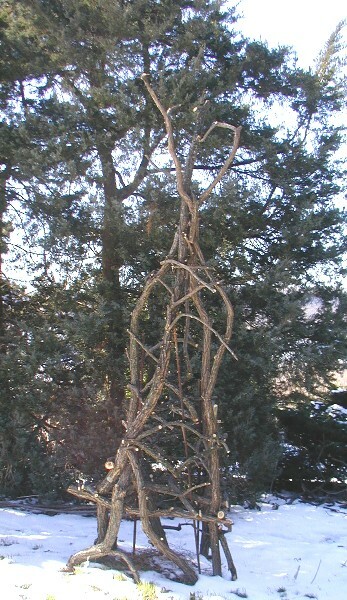 The creative gardener finds possibilities in twisted branches. Gelene went down into the woods and dragged out gnarly, lichen-frosted branches. She cut them down to more managable size and dragged them up to the Wild Garden. Rebar pounded into the ground for a sturdy supporting armature. Branches festooned around this framework and screwed together. Cold weather drove Gelene indoors every now and then, cheeks rosy and Rudolph-red nose.